NEW YORK, October 22, 2013 – James Waller, AIPR Academic Programs Director and Cohen Professor of Holocaust and Genocide Studies at Keene State College, delivered a lecture on September 26, 2013, titled, “The Psychology of Perpetration,” at the United States Military Academy at West Point. 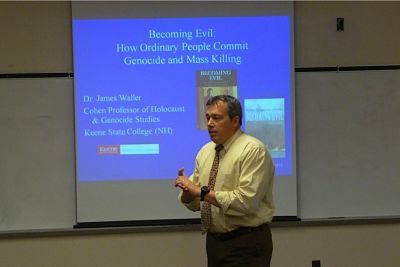 Drawing from his award-winning book,Becoming Evil, Waller focused on the ways in which ordinary people are transformed into perpetrators of genocide and crimes against humanity. The lecture, drawing from a wide range of case studies and field research from the Holocaust, Rwanda, the former Yugoslavia, and other regions, also explored the implications of this research for genocide and mass atrocity prevention. The lecture was organized by Dr. David Frey, Associate Professor of History and Director of the Center for Holocaust and Genocide Studies at West Point (CHGS), as part of his course, “Genocide and Ethnic Cleansing,” which covers theory of genocide, including perpetration, bystandership, and resistance. In 2010, Dr. Frey participated as an evaluator in the U.S. Military edition of the Lemkin Seminar that brought U.S. officers to Auschwitz-Birkenau in Oswiecim, Poland, for one week of education in preventing mass atrocities and protecting civilians during military operations. Roughly 25 cadets and ten faculty members attended the one-hour lecture by Waller, which was sponsored by The Center for Holocaust and Genocide Studies at West Point. Founded in 2010, the CHGS educates the Corps of Cadets about genocide and mass atrocity and inspires them as officers to the cause of prevention. 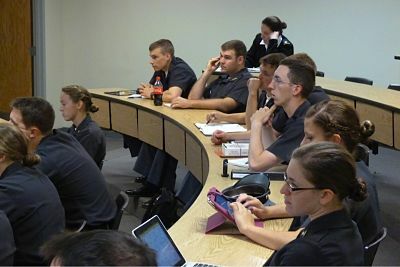 It acts as an inter-academy hub, creating curricular materials not only for the service academies, but for ROTC and for use by the U.S. Atrocities Prevention Board.